Brandeis Special Collections Spotlight: ¡Jovenes! 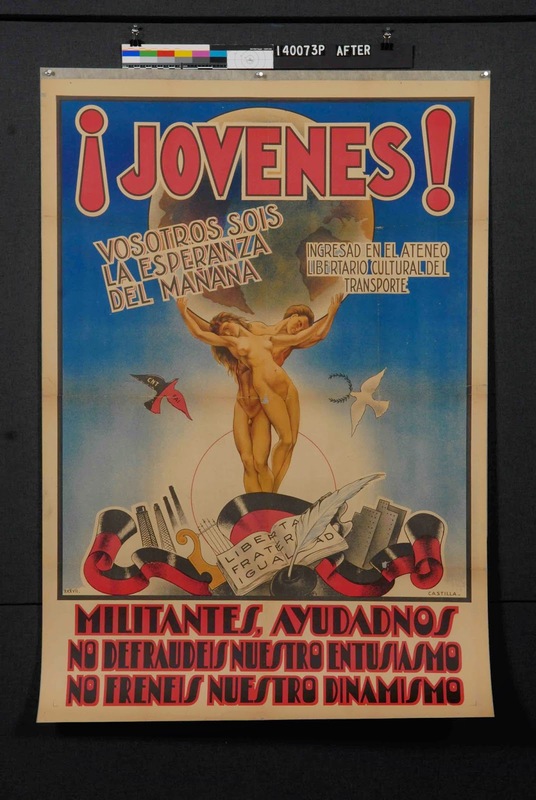 An anti-Fascist poster from the Spanish Civil War entitled ¡Jovenes! is a remarkable new addition to Brandeis University’s Archives & Special Collections. Donated by Gaillard T. Hunt, this poster is notable for its artistic and historical content. It has recently undergone significant conservation work by the Northeast Document Conservation Center (NEDCC). Depicting a naked man and woman holding aloft a globe, ¡Jovenes! (Youth!) proclaims the titular youth of Spain as the hope for that country’s future, and calls on them to join the Transport Workers’ Union. It is a stunning piece of graphic public art which includes many signs and symbols of the Republican faction (including the words “Liberty, Fraternity, Equality” and a black and red dove inscribed with the initials of two major anarchist and union organizations). The poster joins roughly two hundred fifty other anti-Fascist Spanish Civil War posters (brought or sent to the United States by American volunteers in the War) held by Archives & Special Collections. While the poster’s text and imagery have lost no power, the physical item itself has suffered damage over the roughly eighty years since it was first printed (circa 1937). Posters are not created to last, and, as with most items of that type and age, it has yellowed and become fragile and brittle. Having been stored folded, it has torn and been abraded along the fold lines and it arrived at Brandeis in two large pieces. While a significant artistic and historical item, this piece was in no shape to be used by visitors and researchers. Additionally, the damage made it difficult to store the poster in such a way as to prevent further degradation and tearing. As such, the decision was made to have it repaired. In the world of archives and special collections, conservation work is fairly unusual. This may seem odd – why not repair everything? In the first place, this work is expensive and time consuming. In the second, as a guiding rule, archivists attempt to present historical artifacts without commentary or bias, and this includes displaying items as they are, rather than through a filter of repair. It is understood that the damage an object has experienced is a part of its history, and to remove or disguise that damage would be untruthful to the story that object has to tell. That being said, archivists and special collections librarians are also strongly invested in providing free and open access to holdings, and if an item is too damaged to be handled, there can be no such access for our visitors. So, when conservation work is called for, it is almost always to restore the item, not to its prime, but to a stable state where it can be safely seen and used by visitors, researchers and staff, and where it can be stored without being in danger of any further damage. Equally important, all conservation work must always be reversible. At the NEDCC, the poster was analyzed and assessed for treatment and in consultation with our staff, including our preservationist, the extent of the conservation work was planned. Images were taken before, during and after the process, which included dry cleaning methods, a filtered water bath, and mending of tears and insertion of fragments with wheat starch paste. Finally, the poster was lined with toned Japanese paper and wheat starch paste, humidified, stretched dry and encapsulated. As a result of this conservation work, ¡Jovenes! is now able to be an active part of our collections and can be safely seen and used by our patrons who wish to investigate the political, economic and artistic history it so splendidly represents. Description by Surella Evanor Seelig, Archives & Special Collections Coordinator.